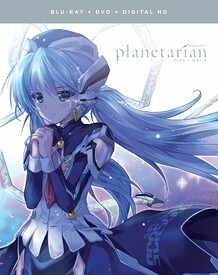 Planetarian Blu-ray/DVD contains the movie and all 5 OVA episodes directed by Naokatsu Tsuda. For thirty years, companion robot Hoshino Yumemi has patiently waited to show someone the stars. Left in an abandoned planetarium, she sits hoping for customers that will never show. That is, until a Junker—a plunderer of goods and artifacts from the ruins of civilization—stumbles upon the crumbling establishment. Will he help her repair the planetarium, or will she be alone once more?